I made some people mad yesterday when I wrote my blog post entitled “Want To Be a Prophet? 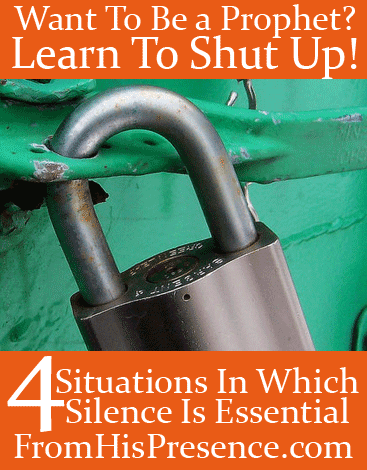 Learn To Shut Up!” But you know what? I’d write it again, exactly the same way. 1) The point of my post was to discuss the need for discretion, discernment, and timing. No one is going to trust you with their secrets, including God, if you can’t be discreet. Nobody is going to come to you for ministry if they know you’re going to blab it all over town. 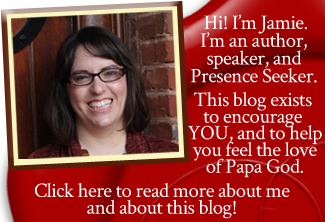 My post was NOT about when prophets should speak, or should have the opportunity to speak. My post was about when prophets should be silent. I never insinuated that prophetic people shouldn’t have a voice; they absolutely should. However, I did say there should be boundaries. 2) God doesn’t call us to be like Jeremiah, Isaiah, or John the Baptist. GOD CALLS US TO BE LIKE JESUS. Jesus only said what He heard the Father say. He only did what He saw the Father doing. That means He was silent if the Father didn’t say it. I, personally, would not go to anyone for ministry if I didn’t think that person wanted to be like Jesus more than anything or anyone else. Would you? 3) Even the prophets only spoke as God gave them utterance. Second Peter 1:21 says, “for prophecy never came by the will of man, but holy men of God spoke as they were moved by the Holy Spirit.” Again, that means that if the Holy Spirit didn’t move them to say something, they didn’t. The issue here is about boundaries. Ray Hughes gives the best example ever in his teaching called “The Warhorse.” He points out that wild mustangs out living in the wild and the free have no boundaries, but they also don’t live long. You don’t see a wild mustang living to its full age because they have no safety or proper care. Bring them into a corral and give them boundaries and proper care, and they’ll live long and prosper. Prophetic people, like any other people, must have boundaries. The boundaries of protocol exist for a reason. THEY ARE TO PROTECT YOU AND OTHERS. When you serve in prophetic ministry, God is trusting you to minister the souls and spirits of men for whom Christ died. If that doesn’t inspire you and fill you with a holy fear and caution–enough to be silent when silence is called for–you should not be in prophetic ministry. I stand by my post yesterday. I’d write it again, exactly the same way. If we serve in prophetic ministry, we should walk with a holy, reverential fear and awe. We should only say what we hear the Father saying and do what we see the Father doing. If we don’t see the Father doing it, we shouldn’t do it. If the Father isn’t talking about something or sharing it with others, we shouldn’t either. If we could all get that–if we could learn to walk in both integrity and power–our world and our churches would be turned upside down. People would know that we are safe. They would come to us when they have a need or are caught in sin, knowing that what we say will be what the Father is saying. They will know that we will not condemn them, but we will speak the truth in love and intercede for their restoration. If we could walk in both integrity and power, then coming to a prophetic person for ministry would be like coming to Jesus for ministry. Hi, Jamie, I would like to weigh in on this subject. I entirely agree with you; discerning the Voice of the Spirit and distinguishing that Voice from ordinary human advice is essential. For the prophet, that means “shutting up.” For the listener, that may actually mean challenging a prophet who has run off the track. But it is also difficult for some people to learn these distinctions (I have special expertise about hearing and listening problems but I won’t go into that here). Which is why I wrote to you a few weeks ago that, generally speaking, prophets should also “shut up” when it comes to interpreting prophecies to individuals. Individuals need to develop an awareness of what the prophetic words mean for them without someone imposing an interpretation on them except as is delivered to the group. The “grey area” is where people are learning about how to receive prophecy and how to deliver a prophecy from God. There need to be small prayer groups where developing prophets and learners can make mistakes without causing calamity. Of course, if there is no one to interpret a prophecy in a meeting, the prophet may have to be the person who also delivers the interpretation or expounds on it with inspired teaching. Where the prophetic voice has been in tongues (glossolalia) someone always should have the interpretation in English or whatever is the main language of the group. Paul set a limit on the number of prophetic tongues per meeting because It is too easy for that type of inspiration to run out of control, i.e., beyond behaviour that is “decent and in good order.” These principles apply within the family group, too, where there can be more than one prophet and where the learners are children. The prophetic Voice should be used with love, like Jesus, as you say, not so much Jeremiah. Although I can think of some places where a Jeremiah would still be useful; God has spoken to me through that OT prophet a few times. WRITE ON, JAMIE. There is something called prophetic protocol. There is a ministry in Santa Rosa Beach, Florida that not only operates in the apostolic and the prophetic but it also trains apostolic and prophetic year round. It is just like going to boot camp and college. My reason for mentioning is that prophetic protocol was a MUST. One thing I learned from them is that one must love God’s people just He loves them. Love is what should motivate prophetic people to minister IN THE LOVE OF GOD. Descretion was describe as “coming through the back door.” I can remember one teacher saying that one should even ask Holy Spirit if it is the right time to speak and how to deliver the message if it was really deep or heavy I.e. Nathan and David. Prayer is always in order when God reveals. Speaking up without the love of God being the true motivation is like setting a fire and expecting it to stay in one place. One must also consider that when we read the Bible we are not reading the everyday details of these OT prophets lives, therefore we do not know why God had them to be belligerent with such individuals or how long they had been praying before God told them to speak. One thing is for sure, when the OT prophets spoke God was their covering and protection. I think some people feel they have to “deliver a word” all the time because they some deeper issues going on like some low self esteem, rejection, or pride. Affirmation of others seems to be more important than loving the people the way God does. So the real question is, what is a prophetic person’s motivation for not wanting to seek God and shut up? Hi Zoe! Thank you so much for reading. Yes, I have been hurt by false prophets as well in the past. It took years to heal from that, but I’m so grateful for the Holy Spirit’s work! He healed me and delivered me from it, so now I don’t feel it at all; He just gave me a testimony about it. Woot! I am sorry that happened to you too. I pray you’ll be blessed as you delight in communion with the Holy Spirit now, and with Jesus, the TRUE Spirit of Prophecy!